Everything You Need for Your Non-Skid Decks! New & Improved with Nano Technology for superior UV Protection & Durability. Everything you need to protect a 200 sq. ft. deck with 2 coats. Superior Traction, Shine & UV Protection for your Boat DecK. NOT SLIPPERY. PREMIUM SURE STEP DECK PROTECT KIT™ contains everything that you need to protect your boat deck and to make it Shine like new. 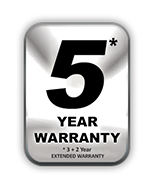 Used by Professional Repair Shops and Dealers, Deck protect kit will give you Guaranteed Results. BOAT CLEAN PLUS™: Cleaner / Degreaser. Removes surface pollutants. BOAT SCRUB™: Deoxidizer / Stain & Scuff Remover / Gelcoat Restorer. SURE STEP™: Top Coat / Polish. UV Protection. Non-Slippery. Everything you need to Clean, Restore, Seal and UV Protect your Non-Skid Deck for an entire season without making them slippery. Coverage: 200 sq. ft.
Non-Slippery UV Protection for your boat deck. The World's Only Pressure Sensitive, Non-Skid Deck Polish! Uses Adaptive Reactive Technology. Skid-X™ Pressure Sensitive Polymer - Grips When Weight of the Human Foot is Applied, With or Without Footwear! Not Slippery - Even When Wet. Ideal for: textured fiberglass, painted decks, cockpits & swim platforms. 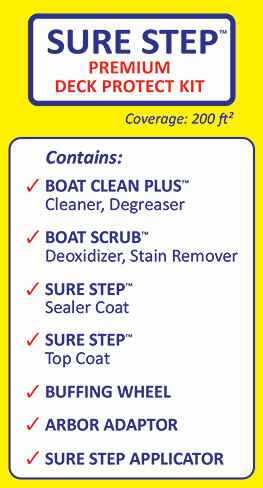 BOAT CLEAN PLUS™ & BOAT SCRUB™ are required to prep the decks for guaranteed results. Textured Non-Skid or Anti-Slip boat decks, cockpits and swim platforms provides important traction, but they all suffer from the same problems. They're constantly getting chalky and dirty. They stain easily from fish blood, red wine and bird droppings. They require constant scrubbing to keep them clean. They get dull, making your boat look old and tired before its time. And, you can't protect them with boat wax without making them dangerously slippery, especially when they're wet. It doesn't matter if yours is a fishing boat, a sailboat a RIB, a wakeboard boat or a cruiser. Maintaining non-skid boat decks is the most tedious part of boat cleaning. There's no end to it. But now, there's a better way. Sure Step promises to restore your faded boat deck to like new again and reduce your maintenance. Imagine your boat decks looking shiny and new and never having to scrub them again. That's what Sure Step can do for you. Today, we're going to show you how easy it is to restore the deck on this tired 1987 Sea Ray with Sure Step. The deck of this boat has more chalk than a math teacher's blackboard and look at the dirt and stains. Sure Step is a sealer as well as a protective polish. We need to get this deck pristine so we don't seal in the crud. First, we're going to clean a small test area to verify that we get the results we want and to make sure there are no unexpected problems. Complete Kit: Everything you need. Eliminates shopping around. Make your tired, hard to clean nonskid deck new again. Eliminates regular scrubbing and scratching. Save money on deck cleaners. Increase safety: Not slippery even when decks are wet. Environment friendly. Run off wont streak your hull or harm marine life. Restore and polish your decks while your boat is in the water or on the hard. UV protection stops chalking and fading of your decks. Stops mold from growing on your deck. Bird droppings, foot prints, dirt, spider specks are easier to remove. Add$ value to your boat. You’ll love the envious glances your boat will get. We guarantee that you’ll love it or you get your money back. 1. Will one Deck Protect Kit be enough for a 33' sailboat? The square footage of the horizontal surface of your boat is approximately (33 x 10.8 x 85% =) 302.94 sq. ft. Coverage of Sure Step is about 200 sq. ft and you need two coats. Coverage of the cleaners is more difficult to estimate as it depends on the condition of your boat and how it's been maintained. If it's in good shape, one bottle of Boat Clean Plus and one bottle of Boat Scrub should be sufficient for the deck and cockpit sole. If it's older, oxidized, has ingrained dirt or grime or if you are stripping other finishes, you will need more. Most sailors use Sure Step on the entire deck, smooth as well as non-skid in order to maximize traction for the safety of their crew, especially when the decks are wet and the boat is pitching around. This is not the time to slip and loose your footing. 2. Cleaning & shining Non-Skid decks and swim platforms? First you need to clean the dirt, bacteria, pollutants and oxidation from the surface and clean out the pores. 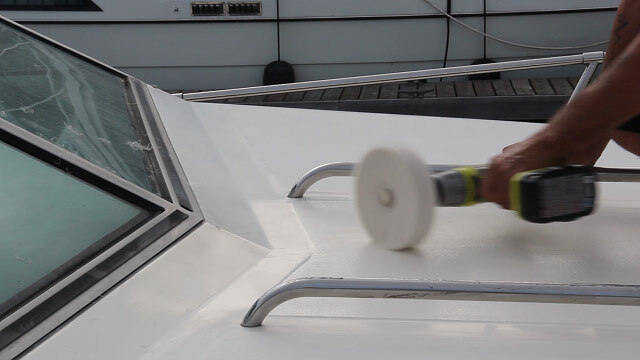 To do this, wash the deck with a 1:4 solution of Boat Clean Plus and water, using a Marine Power Mitt or sponge with some aggressive rubbing, and rinse clean. This will get rid of all the surface pollution. 3. Removing Oil stain on Non Skid Deck? 4. Do I need to clean the deck before reapplying Sure Step? 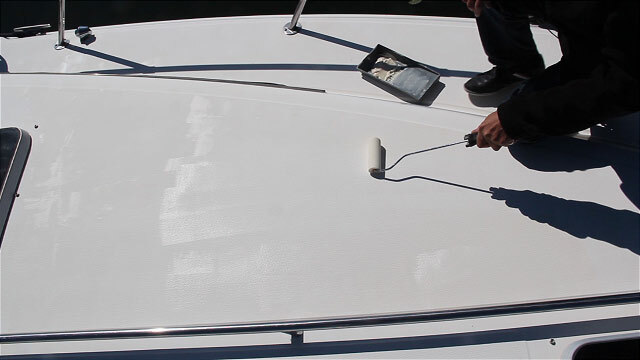 I recommend that you deep clean the surface of your boat at least once a year, prior to the application of a protective polish for optimum results, otherwise you wind up sealing in any accumulated dirt, pollutants, oxidized material, etc. 5. How long before applying 2nd coat of Sure Step? Yes, the second coat can be applied more than 24 hours after the first but not before. The reason is that you need a minimum of 24 hours for the first coat to cure so that the second coat will layer on top for added protection instead of simply removing the first coat and replacing it with the second. The danger of leaving it too long between coats is that it may get dirty and require re-cleaning before applying the second coat. 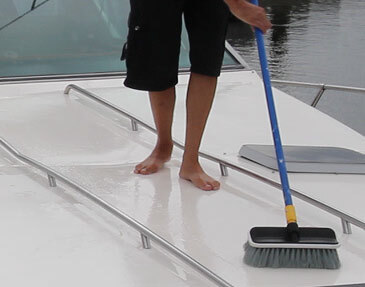 Be sure to clean and prep the surface with Boat Clean Plus and Boat Scrub before applying Sure Step. This is important because these two cleaners will deep clean the pores in the gelcoat, removing dirt, grime, bacteria, suntan oil etc., and the second cleaner will remove any traces of oxidized gelcoat, scuff marks and stains. Remember that Sure Step will seal the gelcoat so if you don't get it pristine, you will seal the dirt, grime and stains, etc., into the finish.